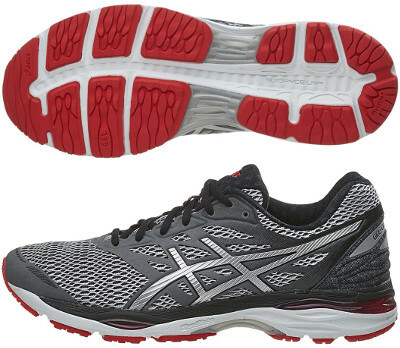 Asics Gel Cumulus 18 are neutral cushioned running shoes. The Asics Gel Cumulus 18 is true to widespread practice of annual update with increased version number, few changes and price boost. It is one of the most popular choices for neutral runners in mid/long distances (notably marathon) due to great blend of responsiveness and reliable cushioning, just one step below the premium Nimbus 18. Upper features not many changes compared to its predecessor the Cumulus 17. Part of the fused elements from the front have been removed and structure over breathable mesh has been redesigned for improved midfoot fit with decoupled eyelets for enhanced pressure distribution. As well as other Asics premium models like Kayano 22, ComforDry™ sockliner not only enhances interior's dealing with odour and moisture but also increases comfort with softer feel. Major change in Cumulus 18 takes place in midsole with more FluidRide™ in the bottom area promoting GEL® distribution closer to foot so it can adapt better to heel strikers and provide smoother transition. Outsole remains almost the same with DuraSponge rubber in the forefoot for better flexibility and response while more exposed areas in the heel are covered with harder rubber AHAR+ to increase durability.